When you say Larimer, you really don't mean Lincoln Larimer do you? As a debt collector I seriously can't recommend anyone moving into this neighborhood. FreeCandy44 wrote: When you say Larimer, you really don't mean Lincoln Larimer do you? As a debt collector I seriously can't recommend anyone moving into this neighborhood. its where all the skinny bike tire hipsters i know live . thats where bakery square and station street hot dogs are. lincoln lemington on the otherhand...well i remember the local pd detective coming to our jr high in the mid 90s and talking about gangs. he said lincoln lemington was the roughest in the city and that they wore green and yellow. dont know how i remember that. I messed up my ghettos. I did mean Lincoln Lemington. Although...behind the Target in East Lib is a very rough housing development. Anyways, you mentioned Station Street Hit Dogs....is it worth the visit? FreeCandy44 wrote: I messed up my ghettos. I did mean Lincoln Lemington. Although...behind the Target in East Lib is a very rough housing development. Anyways, you mentioned Station Street Hit Dogs....is it worth the visit? I'll go this week and let you know. I've been wanting to - I just live down the street so I don't know why I haven't tried anything yet. I just made it to Union Pig and Chicken recently. I got a sampler platter and it was all really good. BBQ seems to be expensive, and you got a lot of food, but for the price I'd probably go somewhere else. Unless you really want BBQ. I don't know why, but I feel pretty let down most places I get ribs or brisket in the city. Definitely don't like it at Double Wide. I thought the lunch price was really fair. for $7 I got a 1/4 chicken and a large side. Larimer is the next slated East End neighborhood to be redeveloped. went to clems yesterday. man is that place overrated. went to charlie palmer's aureole on friday night before book of mormon in nyc right near bryant park. tremendous. absolutely loved it. i had artichoke and broccoli soup that was poured table side over parmesan flan, spicy cashes and pancetta that was delicious, a ribeye with smoked potatoes (the potatoes were probably the best thing on the plate) and then dessert was a chocolate thing with coffee meringue. How is Clems over rated? everyone talks about how amazing it is and it isnt that amazing? it was good. if it was amazing, i would have no problem driving an hour out there to eat. i wouldnt drive 10 minutes out of my way to go there. Letang Is The Truth wrote: it was good. if it was amazing, i would have no problem driving an hour out there to eat. i wouldnt drive 10 minutes out of my way to go there. I can't think of any place that I'd drive an hour for food. Re: Clems. Ribs always seemed like they were cooked right, sauce actually seemed like the best part. I don't need sauce to be overly spicy all the time. I did notice they have a good flavor though. Which Clems did you go to? I never drive to clems just for clems, but if i'm in the area, i'll definitely stop. $25 for $50 at Andrew's Steakhouse at the Rivers. Worth it or no? is it worth in terms of is 50% off a good deal? or is the food good? well i guess is the food worth $44 for a 14 ounce steak. I went to this new "Firehouse Subs" place in Robinson. Food was very good and price was on point. $8.60 for a medium sub (around a 9 inch.. wasn't huge, though), chips, and a big drink. Tons of different varieties of subs. 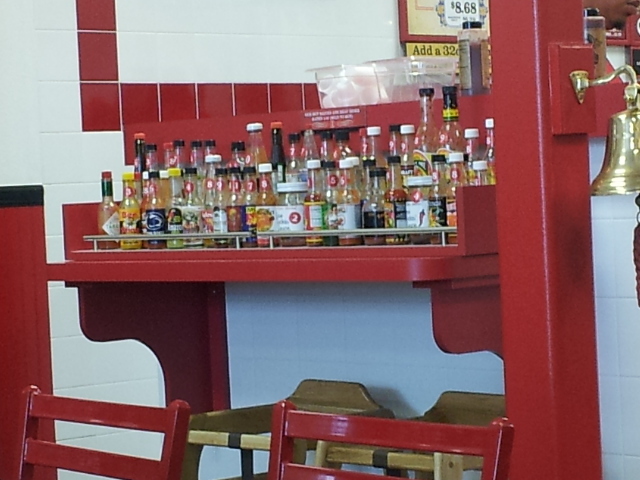 Oh, and their hot sauce bar would make even the slightest hot sauce thief giddy as a schoolgirl. Gank any 'basco while you were there? My brother bought a Groupon for Andrew's a while back, and he took me and our mother along. That was one of the best steaks I've ever had, and the side dishes, drinks, and everything else was also fantastic. I thought it was a better meal than ones I've had a Ruth's Chris and Capital Grille. I wouldn't have expected a casino restaurant to be that good, but it honestly was. Went to Hal's on Babcock after Beefest on Saturday. I got some wings with their Fiery Raspberry sauce. Wow. It may have been a result of my condition, but this was one of the best wing sauces I have ever had. I can't wait to go back and get again. where on babcock is it?